The lowest price of 3M Microfiber Vehicle Washing Cloth(Pack Of 1) was obtained on April 20, 2019 7:39 pm. The cloth is absolutely great.It does a nice work in water absorption and cleaning.Also after washing the got much dirtier but i just rinse in it some foam and its good as a new one.Nice product for the price. The best cloth, I got it at a steal deal of Rs 159I use price tracker, as soon as the price drops I always grab this item quickly as I purchase lot of them often.Just wipe across anything, it gives instant shine without scratches! I was using normal cotton cloth to wash the vehicles and found that it results in scratches. Then I found that using microfibre cloth specially made for vehicles will not cause scratch and I bought this. It’s a bit pricey but worth it. It really works. After cleaning the car the towel gets dirty which is obvious but in a very simple hand wash the towel becomes almost clean as it was when new. No microfibers are left out on the body after wiping the car surface. Good cloth. I’ve used it for a month now and it seems to be doing quite well.I wish I bought this before. The car and bike cleaning time has halved using this as compared to using a cotton cloth. Also, the cloth is very easy to clean. I use the 3M microfiber cloth to clean most things at home.. the thickness is appropriate and can soak more water than any regular or regular microfibre ..This product does the cleaning job very well, doesn’t leave any dirt or scratches behind.. I was very hesitant about buying a cleaning cloth this expensive so I waited for an offer and I got it for 169 and it’s worth every penny. 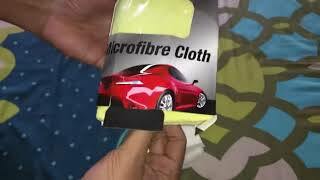 I bought micro fiber cloth of a different brand which was cheaper than this but the quality of the fabric wasn’t good.I would still buy it even if there was no offer.